Get ready for more fun snacking experiences as Jack ‘n Jill Calbee introduces three new products that offer unique and innovative flavors for adventurous taste buds. First on the list is the Spicy Pizza Potato—mouthwatering, tasty chips of pizza goodness topped with real melted cheese and an extra hot kick in flavor for that right blend of tangy and cheesy that you can’t say no to! 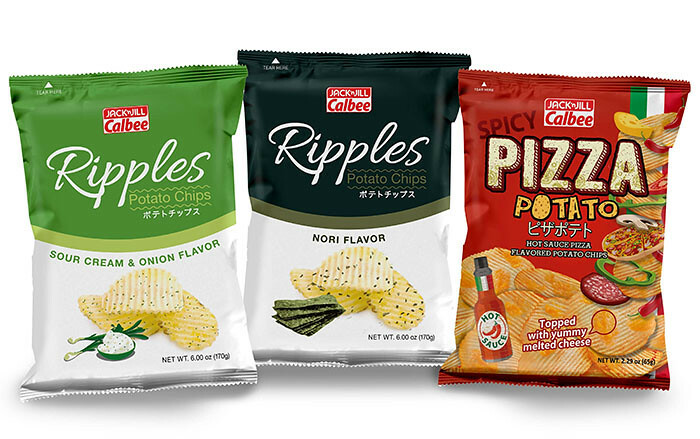 Guaranteed to make waves among snackers is the Jack ‘n Jill Calbee Ripples—wavy-cut potato chips in classic Sour Cream and Onion flavor, and the truly Japanese Nori flavor. Both are available in family packs, as you won’t be able to stop munching from one chip to another. Since introducing a premium selection of snacks boasting of innovative and authentic flavors of Japan, Jack ‘n Jill Calbee has gained a loyal following especially among French fries fans who love the Jagabee Potato Fries for its real crunchy goodness that’s packed in convenient cups and pouches and available in Cheese, Classic Salted, and Garlic flavors. Of course, a Jack ‘n Jill Calbee snacking experience won’t be complete without everyone’s favorite Potato Chips. Offering real potato taste, Jack ‘n Jill Calbee’s Potato Chips offer a unique Wasabi flavour aside from its Cheddar and Sour Cream, and Classic Salted varieties. Indeed, Jack ‘n Jill Calbee will continue to provide Filipinos with unique snacking experiences by satisfying their cravings with innovative treats and authentic Japanese flavors. Get ready for an exciting experience coming your way! Just follow the brand on Facebook, Twitter, and Instagram, and get a chance to win products or something even grander!